Welcome to the Crowne Plaza San Antonio Airport! Our hotel's accommodations near San Antonio International Airport offer area travelers comfort and convenience just minutes from downtown, the River Walk, Henry B. Gonzales Convention Center and important San Antonio businesses.Our hotel's offers guests over 5,200 sq ft of flexible event space, as well as services like a Crowne Meetings Director and a Daily Meeting Debrief. 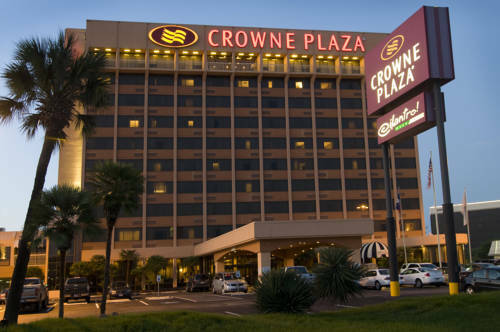 The Crowne Plaza's convenient location allows access to area companies, including USAA, AT&T, Baptist Health Hospital, University, Ft. Sam and Toyota.With popular attractions like the Alamo, San Antonio River Walk, SeaWorld and Six Flags Fiesta Texas just a short drive from our hotel's location, visitors are guaranteed a memorable experience. Shoppers love that North Star Mall is only a mile away, and sports enthusiasts are less than 10 miles from the AT&T Center, the Alamodome and STAR Soccer Complex. Some of our great amenities include an outdoor, heated pool and whirlpool, Fitness and Business Centers, on-site dining and room service from Cilantro Oven, rewards for Priority Club members and the Crowne Plaza Sleep Advantage program.Our hotel's address near San Antonio International Airport along with a complimentary airport and area shuttle make us a great choice, so begin planning your trip to stay at one of the best hotels in San Antonio, Texas. Children's program - Outdoor swimming pool. No life guard on duty, adult supervision required. San Antonio's Premier Shopping Destination with Saks Fifth Avenue, Macy's, Dillards, and JC Penny along Our Shop 'til you drop package includes a $25.00 gift card that can be used at any North Star Mall store. No trip to San Antonio is complete without a trip to see Texas' number one tourist attraction. This shrine celebrates the struggle for Texas Independence. Minutes from the Alamo is the Riverwalk with shops and restaurants lining the San Antonio River. San Marcos is the destination for Bargain Shoppers. Less than an one hour from Crowne Plaza San Antonio is a shopper's Paradise. With name brands like Calvin Klein, Kenneth Cole, DKNY, Old Navy, and Liz Claiborne there is something for everyone here! Morgan s Wonderland is the World s First Ultra Accessible Family Fun Park designed specifically for children & adults with special needs. It allows people of all abilities to play, learn & share life changing experiences in a fun and safe environment. The STAR Soccer Complex has 13 full size, fully lit fields. This facility's attention to detail and dedication to excellence will allow San Antonio to be able to accommodate large local, statewide, national and international tournaments.